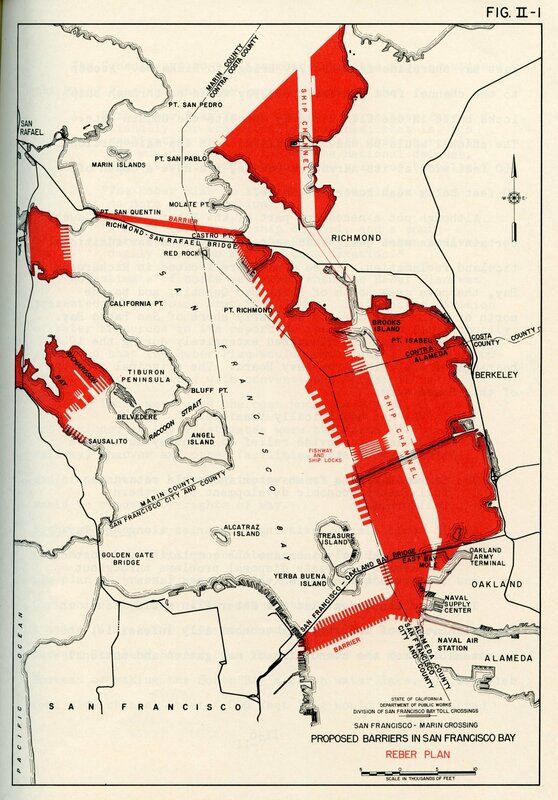 The Reber Plan of 1942 was one of the last of these proposed, filling half of the Bay Area’s bay, providing a potential rival to the Golden Gate Bridge in the barrier blocking the remaining bay from the sea. A ship canal provided salt-water circulation and access, but … why restrict access to a few ships at a time, having to be overseen by a traffic controller, in place of the present huge entry? Dams and barriers were supposed to impound the fresh waters of the Sacramento River into a pair of giant lakes to provide drinking water to the city and irrigation water to nearby farms. As well, 81 square kilometers would be rendered dry land for city expansion (or maybe farms to feed all the new people — nah, don’t waste land on food). Was this considered serious? The San Francisco Chronicle backed it in Causeway to the Future, and in 1953 the US Army Corps of Engineers tested it. Fortunately, the model failed the hydraulic tests. However, the plan was only finally abandoned in the early 1960s. Mind you, by that time various smaller projects had filled in about one-third of the Bay as discovered. It had shrunk from 787 square miles/203,832 hectares in 1850 to 548/141,931. At the time of the Reber Plan, San Bruno Mountain was scheduled to be leveled to provide fill for 27 miles/44 km of San Mateo shoreline. Earlier, but grander, was a proposal to pump dry most of the North Sea, bringing Doggerland — and a lot more — back into the air. 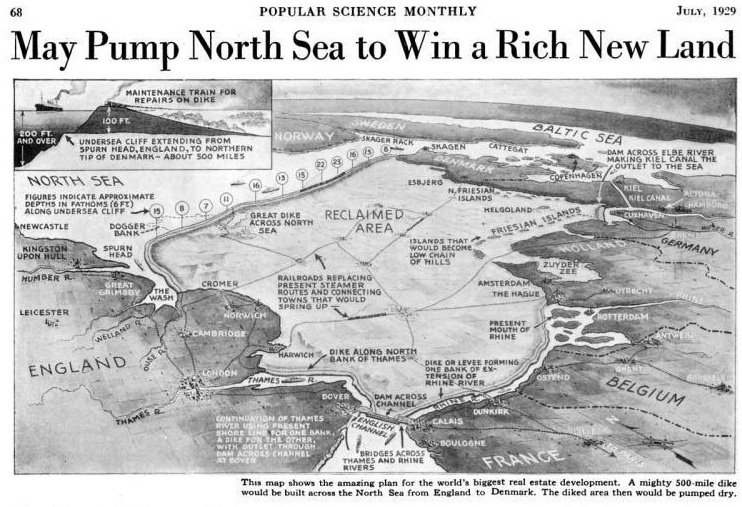 As revealed in the July 1929 issue of Popular Science Monthly, this would add 50,000 square miles/129,499 square kilometres to Europe — but without mention of who would own it. The picture shows it adjacent to England, France, Belgium, Holland, Germany, and Denmark. But the idea came out of Germany. I guess it was a more peaceful way to get Lebensraum. The primary engineering feat would be the 500-mile-long dike (805km) following an undersea cliff across the North Sea, from the northern tip of Denmark to Spurn Head on the east coast of England. Both the Rhine and the Thames would be extended by dikes to reach the remains of the English Channel — the English Bay? — shut off by a dam from Dover to Calais, except for the locks for the great rivers. All the present harbour cities along the sea would become river ports. One has to consider how much the Dutch would have supported this. There is always a danger their reclaimed lands will be flooded in bad North Sea storms. By removing most of the North Sea and putting what’s left a long way off, all the new land would have to be flooded before the sea water reached Holland. Then there was the plan to shunt off the Hudson River to create more Manhattan. Putting its waters down the East River — without it flooding any of its banks — would connect Manhattan to New Jersey, destroy the Hudson River docks, and require building less sheltered ones along the new Hudson Shore. Great improvement! However, if you need to make your dieselpunk alternate world more alternate, just consider if one of these or some other grandiose earth-moving project has gone through. Did they open up the top of the Gulf of Baja, flooding the Mojave to create warm but wetter seaside property? Did they connect the Florida Keys, not with a highway, but by anchoring a new strip of land on them? Did Germany connect East Prussia to the main country by building into the North Sea, and to hell with blocking Poland’s new salt-water access? If your world doesn’t actually connect to ours, you can still use this sort of thing to show their disdain for nature, their need to conquer the terrain, and to create something potentially full of secret tunnels, with a chance for total disaster when the storm of the century comes through.